Ald. 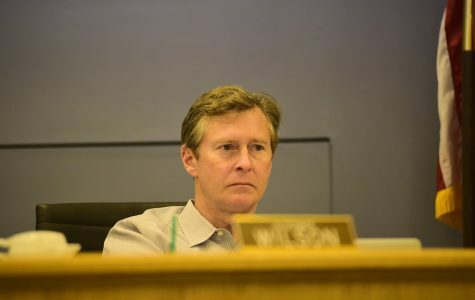 Donald Wilson (4th) attends a city meeting. Wilson's ward contains the Robert Crown Community Center, which will receive a $1 million investment from Northwestern. Northwestern announced Tuesday a $1 million investment in the newly-redesigned Robert Crown Community Center in south Evanston, according to a city news release. The announcement comes about a week after a city official told The Daily that Robert Crown would be rebuilt rather than renovated. The University will make its investment through a programming agreement instead of a charitable gift, distributing funds in three payments over three years. In exchange, Northwestern will have access to use certain facilities in the center. According to the release from fundraising director Michael Happ, the building and park were established in 1974 to better serve the Evanston and North Shore communities. The complex serves as a space for sporting activities including hockey, figure skating, lacrosse, football and basketball. The University’s $1 million investment in the project raised total campaign funds to more than $5.5 million, according to the news release. According to the release, Evanston has $10 million in available bond financing, and Evanston Public Library has $2.5 million. Estimated costs for the entire campaign are about $30 million, meaning the remaining $17.5 million will likely be financed through private donations, program partnerships and sponsorships, the release said. Executive Vice President Nim Chinniah, one of the agreement’s “key architects,” said in the news release that Northwestern is “proud” to make this investment to support the center’s redevelopment. Ald. Donald Wilson (4th), whose ward includes Crown Park, expressed his appreciation for the University’s contribution to the project.